Not quite sure the differences between phishing, malware, a trojan horse or spam? Check out this post over on Google about Jargon Busting. A very important fight right now to protect the Internet. It started with SOPA (Stop Online Piracy Act ) and now it is the Protect IP Act (PIPA). This is very dangerous action that is brought on by lobbyists of the entertainment industry. Instead of adapting, they want more power over the internet and people who are singing "Happy Birthday." (Ok, it's just one example). I encourage you to contacting your congress person immediately. This U.S. Senate bill is extremely dangerous. Laws are already on the books about copyright infringement, but they now want to go after any WEBSITE that allows a posting, even if they don't moderate their site.. Or make PAYPAL stop accepting someone's payments or make ISP's block individual websites. How about censoring your video because you have copyrighted music in the background.. not intentional, but it just happened to be on at the time! This is not the American Way. We don't need to have censorship with the entertainment industry dictating to the public at large because someone sang a copyrighted tune. This is going too far. Please read up and be aware that this will effect a large number of websites, such as FB, Pinterest and other social networking sites. Time to rein in the entertainment industry.. times are changing, use legal recourse like everyone else and learn to adapt. The Senate is scheduled to vote on this internet bill on Tuesday, January 24th. Contact your Senators TODAY and let them know you oppose this legislation. More reading on the topic. Have an old computer that you are ready to give away, sell or dispose? Most likely you will have sensitive information on that machine.. maybe emails, passwords, financial records, tax returns? What can you do to keep this information from getting into the wrong hands? You cannot just delete your files and empty the recycle bin. You cannot just format the hard drive. You cannot just format and reinstall the operating system. In each of these cases, your files can be recovered. There are four ways to make your hard drive files completely unrecoverable and your data safe from being compromised. You can remove the hard drive and physically destroy it. You would need to completely destroy the individual plates and not just the hard drive case. It is amazing what can be recovered on a hard drive by experts. This requires power tools, chemicals or you can purchase a kit called DiskStroyer: Hard Disk Destruction Kit . You can choose to degauss the hard drive. This is a process that uses a reverse magnetic field to scramble the electronic data and make it unreadable. Unfortunately, this machinery is expensive so you would have to contact a professional to provide this service. There are a wide range of free and commercial utilities, such as Active@ KillDisk that will erase your data by overwriting the entire drive. If you are comfortable with changing your boot drives to a USB (by going into the bios) you can erase your information. Please keep in mind that this will also erase the operating system, but of course, you backed that up when you first purchased the computer, right? (Step one... always back up your operating system.) If you aren't comfortable with doing this on your own, contact your local tech person, such as McAllister Park Design (shameless plug). Last, if you didn't heed the warning to backup your operating system, you might want to consider software that virtually shreds your files. Programs such as Shred 4, claim to make data completely unrecoverable. Now, you have to be sure you have removed all the files. File shredder software only secures data that is being or has been discarded. If you have a Mac, it comes with a file shredder type/secure deletion program built in.To securely delete a folder or file, move it to the trash can and from the Finder menu select 'Secure Empty Trash'. Today's Windows tip is just great to know. It's the little things that make life just a little simpler. Walking away from your computer but have confidential files, a project in the works, friendly Facebook hacks nearby or need to avoid little fingers from modifying your document? 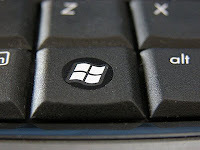 You don't need to use multiple steps to log off or shut down the computer... just hold the "Microsoft" key on your keyboard and click the letter L. POP! You are now logged off and your system is locked from little fingers, sticky fingers and prying eyes!